At the heart of all of our instruments, the optical components are quartz coated and equipped with high-quality encapsulation. They guarantee highest quality, maximum performance and extreme durability. The monochromator with imaging holographic grating enables stray light reduction and absolutely precise measuring results. The minimized number of movable components ensure best reliability, notably improved signal-to-noise ratio and best energy throughput. Real double-beam mode for highest precision and a better long-term stability by measuring the sample and reference signal at exact the same moment. The measurement results always show a current comparison of both beams. This way lamp fluctuation and drifts are corrected by the second beam. Furthermore is a direct compensation of the blanc solution possible. Routine or special analysis – the SPECORD PLUS guarantees flexible operation in all areas of application. Thanks to its extensive range of accessories and the modular software concept the device provides a unique individuality. The SPECORD PLUS is equipped with comprehensive basic software and numerous specific tools for individual applications. WinASPECT PLUS software serves for complete control, monitoring, and documentation of all operations from spectrophotometer to accessories. It guarantees the GLP-suitable operation up to the complete conformity with FDA 21 CFR Part 11. Linking the system to your LIMS and the user-specific export of data to external programs (e.g. Excel) are also possible. The intuitive software navigation and the intelligent operating system allow for easy operation. SPECORD PLUS offers a special software for validation to provide tests of device parameters of your SPECORD PLUS in compliance with internal or external quality standards. Conformity to FDA 21 CFR Part 11 ensures comprehensive user management, an electronic signature facility and the Audit Trail. The SPECORD PLUS offers the right solution for numerous applications. Routine analysis or special application in chemistry, pharmacy, medicine, food control, environment, life science and many other areas – with SPECORD PLUS you are well prepared for all future requirements. UV/Vis spectroscopy is a method of molecular absorption spectroscopy with ultraviolet and visible radiation mainly on liquid samples measured in transmittance or absorbance. Measurements on solid and gaseous samples are also possible. Thereby, one can obtain qualitative information (like purity of substances, substances identification or binding conditions) as well as quantitative information (like concentration via endpoint measurement or via kinetic). The SPECORD® PLUS offers the right solution for numerous applications. Routine analysis or special application in chemistry, pharmacy, medicine, food control, environment, life science and many other areas -- with your SPECORD® PLUS you are well prepared for all future requirements. SPECORD PLUS® - Zeit für neuen Anspruch! Analytik Jena AG: Spectrophotometer SPECORD PLUS - Food and Drug Administration Compliance Guaranteed! 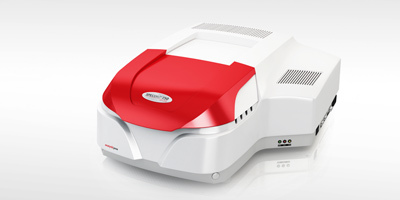 Reviews have been disabled for SPECORD PLUS - UV/Vis Double Beam Spectrophotometers.